Your cultural itinerary includes sights like Tanah Mayan Art Museum and Caracol. Eschew the tourist crowds and head to Xunantunich and Sak Tunich Art Gallery. Make the 22nd (Mon) an awe-inspiring day at Elijio Panti National Park. The adventure continues: explore the fascinating underground world of MayaWalk Tours, get a taste of local nightlife at Art Box Belize arts & crafts center, identify plant and animal life at St Herman's Cave, and admire the sheer force of Big Rock Falls. To see ratings, photos, other places to visit, and tourist information, use the Cayo road trip tool . Akureyri, Iceland to Cayo is an approximately 29-hour flight. The time zone changes from Greenwich Mean Time to Central Standard Time, which is usually a -6 hour difference. Expect much warmer temperatures when traveling from Akureyri in October; daily highs in Cayo reach 35°C and lows reach 28°C. Wrap up your sightseeing on the 22nd (Mon) to allow time to drive to Big Falls. On the 23rd (Tue), relax in the rural setting at Agouti Cacao Farm, then don't miss a visit to Nim Li Punit (Big Hat), then admire the natural beauty at Belize Spice Farm & Botanical Garden, and finally examine the collection at Maya House of Cacao. Keep things going the next day: view the masterpieces at We Art Gallery, then step off the mainland to explore Snake Cayes, and then explore the ancient world of Lubaantun. Plan my Big Falls trip by asking Inpirock to come up with tips and suggestions. Getting from Cayo to Big Falls by car takes about 4.5 hours. In October in Big Falls, expect temperatures between 36°C during the day and 26°C at night. Finish your sightseeing early on the 24th (Wed) to allow enough time to travel to Placencia. Once a humble fishing village, Placencia has been transformed into a leading tourist destination, with its focus primarily on outdoor activity and natural exploration. Visiting Glover's Reef Marine Reserve and Cockscomb Basin Wildlife Preserve will get you outdoors. You'll discover tucked-away gems like Maya Center Mayan Museum and Spas & Wellness. Explore Placencia's surroundings by going to Hopkins (Garimaya Gift Shop & Scuba & Snorkeling) and Studio Gallery Cayetano (in Dangriga). There's much more to do: head off the coast to Laughing Bird Caye National Park, take in the spiritual surroundings of Placencia Fellowship, relax in the rural setting at Bunches of Fun Banana Farm Tours, and stop by Denyse's Originals. For more things to do, other places to visit, reviews, and other tourist information, refer to the Placencia tour planner . You can do a combination of car and flight from Big Falls to Placencia in 2 hours. Other options are to drive; or do a combination of car and bus. In October in Placencia, expect temperatures between 36°C during the day and 26°C at night. Finish your sightseeing early on the 29th (Mon) so you can fly to Caye Caulker. Appreciate the collections at Aria Kat Art and Red Flower Gallery. You'll discover tucked-away gems like The Split and Spas & Wellness. 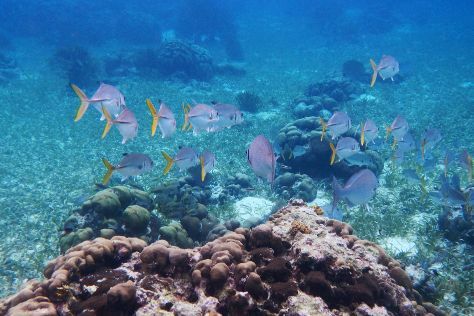 And it doesn't end there: identify plant and animal life at The Estuary of Caye Caulker, stop by Michael's Blue Coral Gallery & Gifts, see some colorful creatures with a scuba or snorkeling tour, and see the vivid underwater world at Turneffe Reef. For other places to visit, maps, ratings, and more tourist information, refer to the Caye Caulker journey builder website . You can fly from Placencia to Caye Caulker in 1.5 hours. Other options are to do a combination of flight, shuttle, and ferry; or take a bus. Expect a daytime high around 35°C in October, and nighttime lows around 28°C. Cap off your sightseeing on the 1st (Thu) early enough to travel to Orange Walk. An agricultural town that has become an economic hub, Orange Walk sits in a privileged position among ecologically diverse landscape, fertile fields, and historical ruins. Start off your visit on the 2nd (Fri): steep yourself in history at Lamanai Archaeological Reserve. Get ready for a full day of sightseeing on the next day: get outside with Lamanai Eco Adventures, delve into the distant past at Santa Rita Archaeological Site, and then explore the ancient world of Cerros Archaeological Reserve. To see reviews, more things to do, other places to visit, and other tourist information, you can read our Orange Walk vacation planner. Getting from Caye Caulker to Orange Walk by combination of ferry and flight takes about 2 hours. Other options: do a combination of flight, car, and bus; or do a combination of ferry, flight, and car. Due to the time zone difference, you'll lose 1 hour traveling from Caye Caulker to Orange Walk. November in Orange Walk sees daily highs of 36°C and lows of 24°C at night. You'll set off for San Pedro on the 4th (Sun). Explore hidden gems such as Shark Ray Alley and The Gallery of San Pedro. Get in touch with nature at Hol Chan Marine Reserve and Secret Beach. Spend the 8th (Thu) exploring nature at Bacalar Chico National Park and Marine Reserve. There's much more to do: soothe aching muscles at some of the top local wellness centers, head outdoors with Rum Punch II, see the vivid underwater world at Mexico Rocks, and stop by Belizean Breezes Soap Co. and More. To see ratings, traveler tips, where to stay, and more tourist information, go to the San Pedro trip itinerary builder . San Pedro is just a stone's throw from Orange Walk. Traveling from Orange Walk to San Pedro, you'll gain 1 hour due to the time zone difference. Expect a daytime high around 34°C in November, and nighttime lows around 26°C. Wrap up your sightseeing on the 9th (Fri) early enough to fly to Belize City. Belize's biggest urban center, Belize City is a culturally diverse seaside destination. 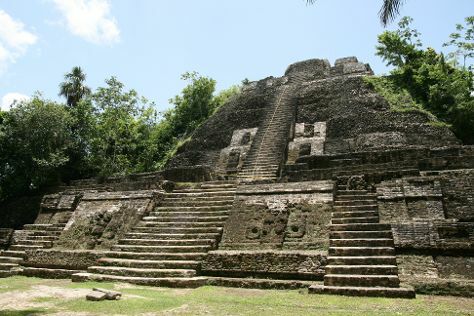 Get some cultural insight at Altun Ha and Museum of Belize. Eschew the tourist crowds and head to Zipline and Community Baboon Sanctuary Visitor Center and Museum. Step out of Belize City to go to La Democracia and see The Belize Zoo, which is approximately 42 minutes away. On the 13th (Tue), spend a relaxing day on the river with a rafting and tubing tour. There's lots more to do: look for all kinds of wild species at Altun Ha & The Olde Belize River, learn more about the world around you at St John's Cathedral, examine the collection at Luba Garifuna Cultural Museum, and look for gifts at Diamonds International. To find photos, more things to do, and other tourist information, you can read our Belize City trip planner. Belize City is just a stone's throw from San Pedro. In November, daytime highs in Belize City are 34°C, while nighttime lows are 26°C. Wrap up your sightseeing by early afternoon on the 14th (Wed) to allow time for travel back home.